Let's get one thing straight: I'm a huge fan of TNA Wrestling. Been so ever since when I watched Scott D'Amore form one of my favourite heel professional wrestling stables - the illustrious Team Canada. Their wrestling angle was simple: unite the Canadian TNA wrestlers into a single, red-and-white powerhouse faction. The group's theme music was an awesome electric guitar remix of the Canadian National Anthem, and they came down the aisle waving a Canadian flag attached atop a hockey stick. A diehard Canadian wrestling fan couldn't ask for much more than that. Even though Team Canada has since disbanded, many of the wrestlers have moved on to successful singles careers within TNA. 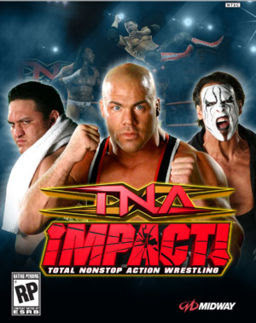 That's why when read IGN's hands-on impression of TNA iMPACT! (PS3, Xbox 360, Wii) I was quite dismayed that only one former Team Canada member is confirmed in the game - Eric Young. They have of course included another Canadian, Christian Cage, but given his headlining propensity, his inclusion was a given. So will we see absent ex-Team Canada superstars such as: Petey Williams, Robert Roode, or Johnny Devine? Well, Midway have announced that 25 wrestlers will appear in the game, and 18 have been confirmed thus far - meaning there is still hope. Given the huge pushes Petey Williams and Robert Roode have received of as late, they do seem on the surface to be logical choices. The problem of course, is that from a marketing standpoint it makes sense to select household name wrestlers to promote the game - and there are still many well-known TNA wrestlers not yet confirmed (e.g. Team 3D, Black Reign, Kevin Nash, & Kip James). Meaning the 7 remaining spaces could fill up quickly. Will we see some more maple leaf muscle in the final retail product? TNA iMPACT! does have the potential to be very Canadian-friendly. I guess we'll have to wait until game gets released in September to know for sure.